Kristen Stewart was roundly lambasted for her performances in the insipid Twilight films, as if to suggest that she was responsible for the movies being so god-awful, rather than the material with which she was lumbered. For whatever reason – and it seems to have more to do with her perceived personality than her ability as an actress – Stewart has continued to draw fire from critics ever since. However, recent roles (Still Alice, Camp X-Ray) have enabled Stewart to prove herself an actress of considerable talent and her performance in Clouds of Sils Maria alongside Juliette Binoche has seen her become the first American actress to win a César, the French equivalent of an Academy Award. In Clouds of Sils Maria, Binoche plays Maria Enders, an actress who agrees to appear in the revival of a play that launched her career, with Stewart as her assistant Valentine. Both women are terrific in a film that becomes much more than it first seems with an unexpected, for me at least, event late in the piece left me questioning everything I had seen up until that point. Written and directed by French filmmaker Olivier Assayas (Irma Vep, Something in the Air) and shot on location, as the title suggests, in Switzerland, The Clouds of Sils Maria is highly relevant given the current discussions around the dearth of roles for women in Hollywood, particularly for those over 40 (unless you are Meryl Streep). You see, Maria is at the peak of her career when she is asked to perform in a revival of Maloja Snake, the play that made her famous some 20 years earlier. Back in the day, Maria played the role of Sigrid, a young girl who bewitches her boss, Helene, and drives her to suicide. However, now Maria is being asked to take on the role of Helene, an offer that leads her to question what the future holds for her as she gets older. Maria retreats to the Alps with Valentine to rehearse and the parallels between their relationship and those in the play become more apparent as the film progresses. In essence, this is a psychological drama that offers considerable insight into an actor’s preparations for a role, the nature of celebrity, aging and the passage of time. The first moments of the film revolve around Maria’s preparations to accept an award on behalf of her friend Wilhelm Mechior, the reclusive playwright responsible for Maloja Snake and, effectively, launching her career. However, on their way to the ceremony, Maria learns that Wilhelm has died, the details of which become more clouded as the film progresses. In addition to coming to terms with the loss of her friend, Maria is also forced to confront the changing nature of her industry and reflect upon her own place within it through the prism of Jo-Ann Ellis (Chloë Grace Moretz), a young Hollywood starlet with a penchant for scandal who has been tapped to take on the role of Sigrid in the play. Through Maria’s fits of self-doubt and frustration, Valentine remains the voice of reason as the two women hike the hills, read lines and take in the scenery that has been captured in all its glory by cinematographer Yorick La Saux (Only Lovers Left Alive). There are others who flit in and out of the narrative, but it is Binoche and Stewart who lift the film with their performances; Stewart is particularly naturalistic and nuanced in her portrayal of this highly competent young woman. Moretz is also fine in a much smaller role and, in a far cry from the Hollywood tradition of 30-year-olds playing teenagers, she looks almost too young to play this actress whose talent is almost outstripped by her capacity for chaos. Assayas blurs the lines between fiction and reality, with the title of the play-within-the-film drawn from a real meteorological phenomenon in which thick white clouds wind their way through the Maloja Pass. First captured on film in the 1920’s, this black and white footage appears in the film and inspires Maria and Valentine to venture out and see it for themselves. 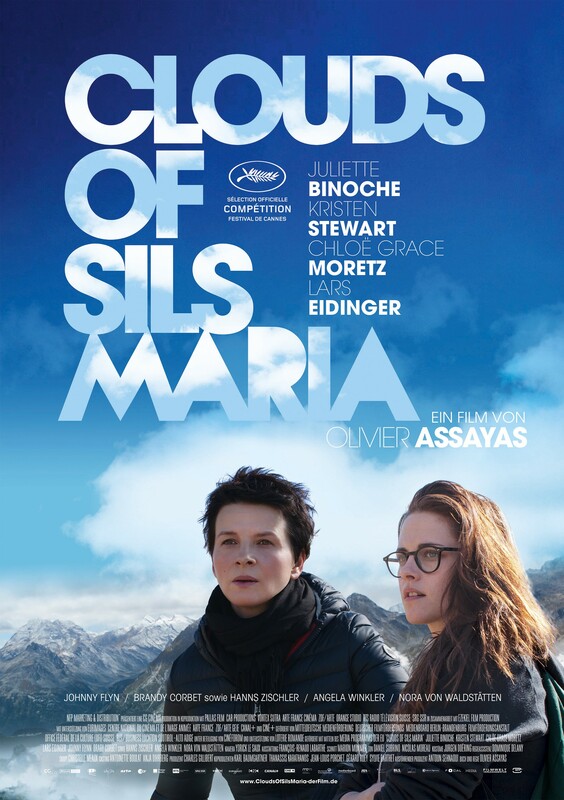 Some might find Clouds of Sils Maria somewhat dry and abstract, but there is lots going on that make it an intriguing and thought-provoking piece that affords Binoche and Stewart the opportunity to showcase their considerable talents.